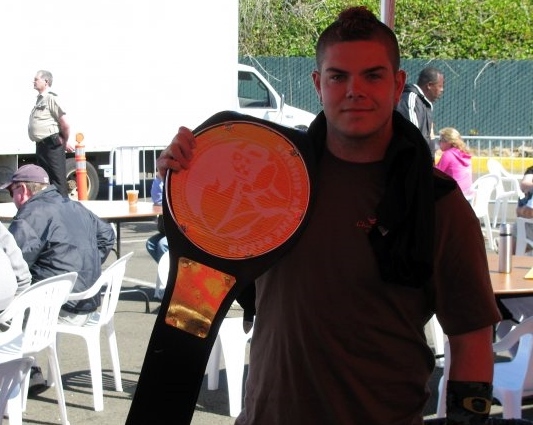 This entry was posted in Competitive Eating, Oregon and tagged Barbecue (Cuisine), bbq, beach, brewfest, broadcast, Cameron McKirdy, coast, Competitive Eating (Sport), Contest, food, fox 12, funny, hot dogs, ifoce, Joe Vithayathil, KPTV (TV Station), live, local, Major League Eating, meal, mohawk, morning, news, Oregon (US State), ribs, show, television, TV, United States Of America (Country). Bookmark the permalink. No. Took it from the Champ Joey Chestnut when he wasn’t looking. We was cool and hung out with my friends and I after the big eating contest he won.